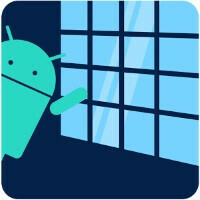 Here's a twisty riddle: what does your Android phone have that your Windows 8 PC doesn't? Hint - it's the start menu! Tee-hee-hee! 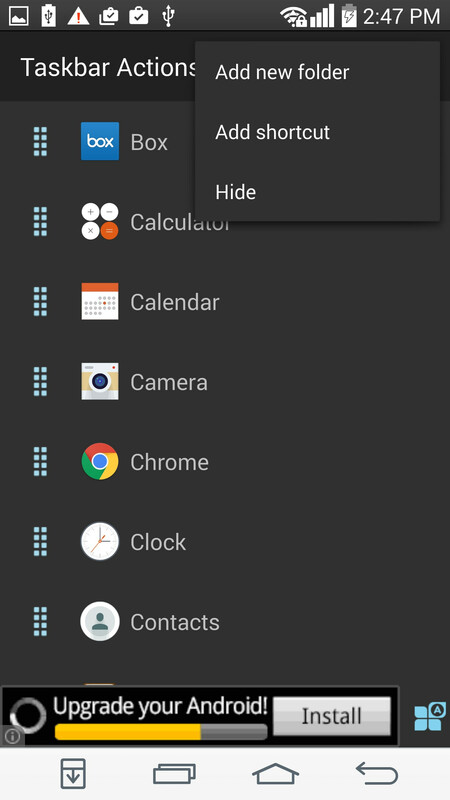 Seriously, though, if you're that special type of a user who wants to decorate their Android homescreen with a Windows-not-8-like Start Menu, you are going to have a really easy time. 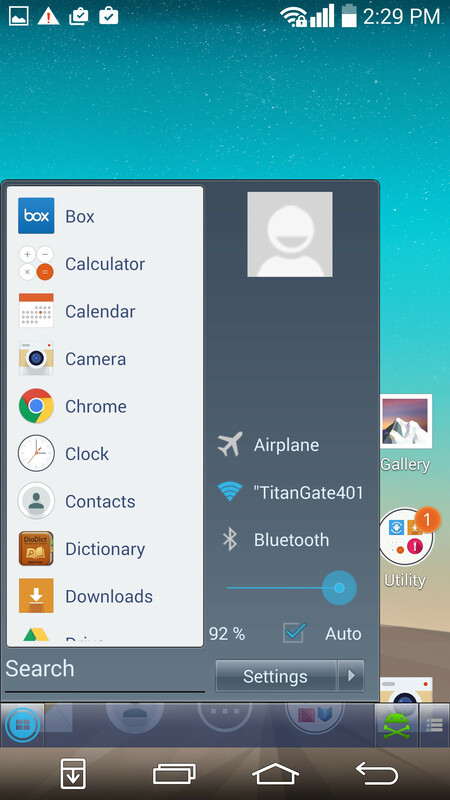 Just install the free app Taskbar from Google Play and we'll show you how to use it. When you're finished installing Taskbar, start it by tapping the shortcut on your homescreen or app drawer. 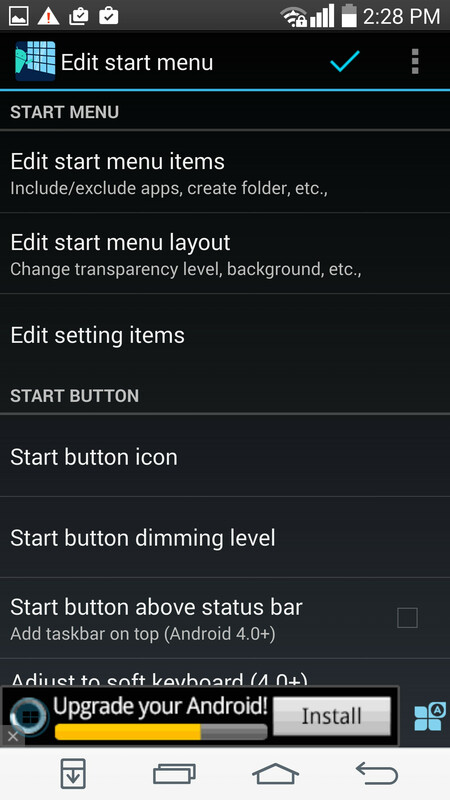 Tap "Enable Taskbar" to start the service, and then tap "Edit Start Menu" to start tweaking. As you can see, adding new folders and shortcuts inside it is an easy, and pretty familiar affair - unless you've grown using a Mac. 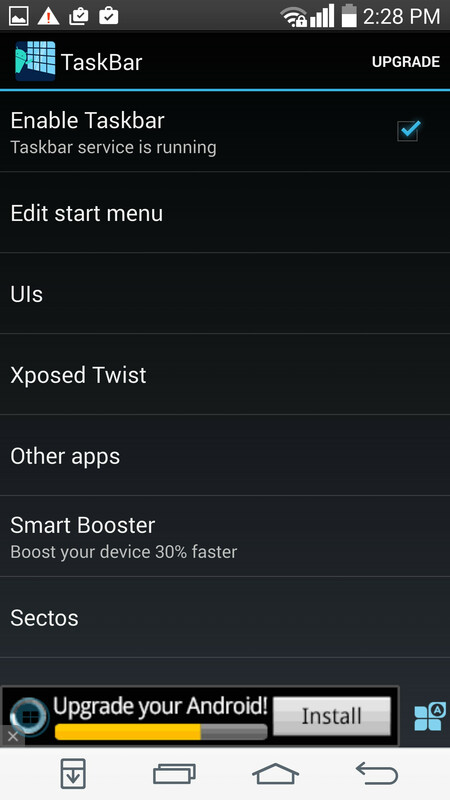 You can adjust the Start Menu's height and transparency, as well as add toggles such as Wi-Fi and location. When you're done customizing your start menu, head to the UIs menu to set the taskbar theme and position. 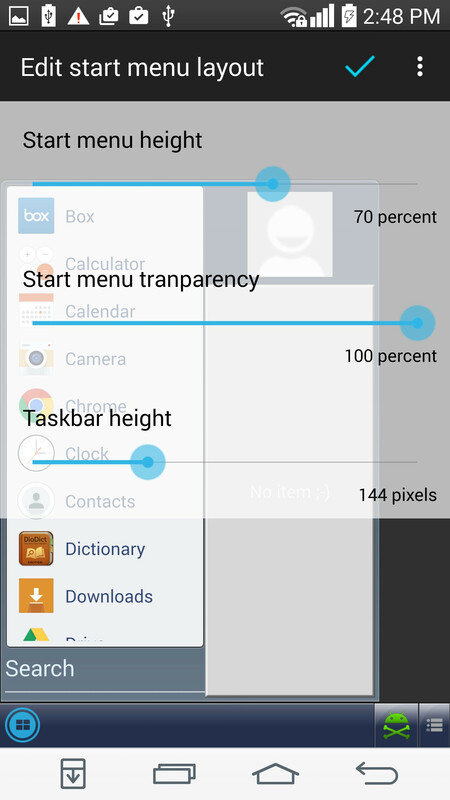 In the case of the Taskbar app, "taskbar" simply means a faint button that you can position to the left or right, top or bottom of the homescreen, and tap it to activate a Start Menu and taskbar overlay. A real sweet feature for rooted devices that have Xposed framework installed is placing the taskbar icon inside the navigation button bar for a truly desktop-like feel. And that's it! Enjoy your start menu, and don't forget to put a funny profile pic inside the right column! That'd be like disconnecting the cable, throwing away the remote an shutting the color option off, on the TV. I suppose for some. I guess those with those Android laptops could use this; but at that point I'd question why they didn't just get a windows laptop. Well you get pretty much all of Google's ecosystem with a ton of apps. 2015 is also suppose to be the year for Android studio running on Android devices as well. No need to develop on a Windows system anymore. That will be a sweet day. there is a way to "unsee" this ? Ewwwww.....the Start Menu!!! I'll take the Start screen over the Windows 7 or older start menu any day. I do like the Windows 10 Start Menu Screen though as it combines features of both "Starts". Getting rather used to the 10 now that I have been using it on both a tablet and desktop. I am surprised at how stable it is. Not a single crash yet, either through video editing, 3d model creation, and general office work. Though I also like the 8 way of doing things, especially on my tablet vs desktop. Phonearena needs to tone down on their pro Android bias, no need for the " if you're into that sort of thing" comment, those who want it will download it, those who don't wont. Simple as that. I expect those attitudes from commenters, not editors . Hold yourself to a higher standard. So the users opinion that should accept any standard or it is Microsoft Windows that should just go up to a higher standard ? As a user, sure they have their own standards, as article writers on here....yea it can go the way side. How many other launchers or ui modification get the same treatment? I wait for you to dig up the article.